"Plenty of fun for the comic book-and-anime-minded"
With the phenomenal success of "The Avengers," and high-profile July releases of "The Amazing Spider-Man" and "The Dark Knight Rises," comic books are more visible than ever. Nearly as prominent are comic book conventions. At these organized events, fans can attend panel discussions and debate, with other fans, the merits of casting Anne Hathaway as Catwoman or where George Lucas first went wrong. The monster of fan conventions is July's Comic-Con in San Diego. A multigenre event, Comic-Con offers panels filled with television and movie stars. It also sells out within hours, months before the event. For Sacramento-area comics fans who could not get a Comic-Con pass or who lack the money to get to San Diego, there are plenty of inexpensive comic book and otherwise geek-centric events to attend close to home. One is Sunday's Sac-Con, at the Scottish Rite Center near California State University, Sacramento. Each quarterly Sac-Con draws 1,500 visitors and loads of artists and vendors. Getting into the 10 a.m.-5 p.m. event costs $6. If you do the math (and geeks do), it works out to less than $1 for each hour of entertainment. "You don't have to go to San Diego to geek out," said Stephanie Rector of the Sacgeeks.com website and community group. Rector, 39, should know. Her site offers a comprehensive monthly calendar of all things geek, geek- adjacent and whiff-of-geek. 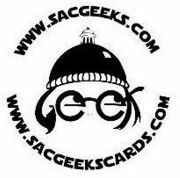 Sacgeeks also has formed a panel to discuss the state of Sacramento geekdom at 4:30 p.m. Sunday at Sac-Con. Rector and her group have produced a deck of playing cards honoring 54 geek-friendly area businesses, events and people. The summer's top-tier comic book movies (no Green Hornet or Green Lantern in sight) represent a high point for comic book awareness, Rector said. But the broader culture already is thick with geek culture. "It is becoming more acceptable to be a geek, because of technology," she said. "Everyone has their smartphones and social media. The more you are on Facebook, the more you are exposed to memes." Internet fan sites and message boards now dovetail with longstanding brick-and-mortar Sacramento comic book shops and conventions. Ben Schwartz, owner of Sacramento's Empires Comics Vault, said he sees spikes in interest when high-profile films are about to come out. Some of those new comic book readers will lose interest, but others will spark a longtime interest in the form. "Every time we get a big push like 'Avengers,' it goes up, and when it comes back down, we are always higher than we were before," Schwartz, 36, said while restocking bins at his bright, spacious Fulton Avenue store. At Empires Comics Vault, new comic books share space with back issues and a small statue, priced at $108, of a bloody Uma Thurman from Quentin Tarantino's "Kill Bill" movies. Most comic book devotees are not kids but adults in their 20s, 30s, 40s and 50s. In other words, people who can afford $108 statues of Uma Thurman from "Kill Bill." Or to spend a weekend at a comic book convention in San Diego. These readers and collectors sustain events such as Sac-Con, in place for more than two decades, and SacAnime, a twice-a-year Sacramento convention that draws 4,500 fans of Japanese animation. "When I first moved here, I couldn't believe how many comic book and animation shows there were," said Jason Dube, 39, who helps run Sac-Con and SacAnime. 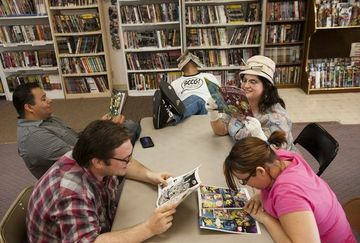 A comic book artist and publisher, Dube also leads the Sacramento Comicbook Creators Group, which meets every Tuesday evening at Empires Comics Vault. Dube joined several other comic book fans – all Comic-Con veterans – last week at Empires Comics Vault to discuss films and fan conventions. In the Bay Area, where Dube lived previously, the emphasis was on bigger conventions such as WonderCon, he said. Here, comics-related events are more frequent and more intimate. It's easier to talk with the writers and artists at the local conventions, said Nick Pettigrew, a 26-year-old comics fan and sketch comedian. "Comic-Con and some of the other (bigger conventions) have kind of minimized the actual contact you have with creators," Pettigrew said. Comic-Con has become "such a spectacle," Pettigrew said, that it's worthy of spoofing. He and his sketch colleagues will send up Comic-Con on July 13 – one of the days it happens – as part of his bi-monthly sketch show "Critical Hit," at Sacramento's Comedy Spot. The sketch comedians will replicate the San Diego convention's celebrity panels, answering audience questions while in character. "So if you can't get a ticket to Comic-Con, you can come to our show," Pettigrew said with a laugh. Local shows also offer far-lower rates to vendors, said Sarah Adamovich, 27, who sells comic books and graphic novels at conventions. Adamovich also helped put on a big, new local convention, called Decepti-Kon, last year with the convention's founder, Luis Perez. Scheduled again for this fall, Decepti-Kon welcomes all sorts of organized fan groups, Perez said, from comics fans to remote- control vehicle enthusiasts to people who dress up like pirates. "If there is a subculture out there, I house a place for them to share their passion," Perez said. No matter their main passion, most Sacramento geeks keep an eye on the big comic book films. And they tend to agree that "The Amazing Spider-Man," out July 3, is unnecessary. A casual survey of comic book and geek-culture fans, including those gathered at Empires Comics Vault last week, revealed a love for "The Avengers," high hopes for "Dark Knight Rises" and apathy toward "The Amazing Spider-Man," a revamp of the Tobey Maguire movies. The Maguire films were too recent to need a revamp, Schwartz said. "It's just going to be repeated," he said. "We are going to watch 45 minutes of origin story." Whether one attends Comic-Con, Sac-Con or slips into a local comic book store on a Wednesday, three things always will be evident: comic books, action figures and strong opinions. Call The Bee's Carla Meyer, (916) 321-1118. SAC-CON: The comics, anime and toy show runs 10 a.m.-5 p.m. Sunday at the Scottish Rite Center, 6151 H St., Sacramento. Cost: $6. www.sac-con.com. SACRAMENTO COMICBOOK CREATORS GROUP meets at 6:30 p.m. every Tuesday at Empires Comics Vault, 1120 Fulton Ave., Sacramento. See "SCCG" on Facebook.